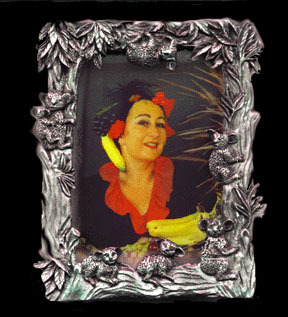 Cooking with Carmen was a body of work from my multimedia project titled Big Banana Time Inc.
Carmen Banana was one of the faces of Big Banana Time Inc. Carmen made her official debut in 1998 as a web based digital collage for Griller Girls – an exhibition of works by female new media artists curated by Di Ball for Volt-the new performance in 1998. Carmen Banana has been inspired by a number of women bearing the same name. Carmen Miranda is of course the primary identity attached to this persona. The femme fatale character in Georges Bizet’s masterwork ‘Carmen’ is also a contributing influence. Bizet’s Carmen was, according to Germaine Greer (HQ magazine) a real person of gypsy heritage, who organised workers in a cigarette factory in Spain. With Carmen Miranda in particular, there is a desire to play with such artificial constructions of feminine identity and experience of the world…..a return to childhood realms of the fantastic….nostalgia has many connections with childhood…..Within Carmen’s character there is a two fold interest – the process of representation inherent in the manifestation of nostalgia >its contrived production – and as a vehicle to ‘act out’ attitudes/behaviours/experiences through existing representations esp. about those aspects of myself which I find strange and hard to grapple with – the foreign part of myself.